In part two of this four part series, Nicolas Suszczyk reflects on Daniel Craig's tenure as James Bond over four films. In line with the tone with Bond's pledge of revenge at the end of 'Casino Royale' (both the novel and the film), in the 22nd film of the EON series 007 follows the leads of the organization behind Le Chiffre. Having captured Mr. White at the end of the 2006 movie, Bond 22 would start some hours after the ending of 'Casino Royale', with MI6 interrogating the captive Mr. White. In February 2008, it was announced Bond 22, set for a November release, would take another Ian Fleming title: 'Quantum of Solace', a short story from the 'For Your Eyes Only' book published in 1960. As the original story dealt with Bond in the Bahamas invited to a meeting by the Governor, who tells him a story of a man cheated by her stewardess girlfriend where the "quantum of solace" between the couple was broken. Therefore, none of the actual plot would be used except for a short sentence where it is mentioned that Bond visited the opera. In the film, 007 follows one of the organization's agents to a Tosca performance in Bregenz. Directed by Marc Forster, acclaimed for 'Monster's Ball' and 'The Kite Runner', the 2008 production fails to catch the essence of a James Bond movie due to the poor script and failed editing process, with second unit director Dan Bradley opting to go for the "shaky camera" technique for the action scenes as editors Matt Chassé and Rick Pearson failing to integrate the action scenes in an appeasing way. Bond brings Mr. White to the MI6 safe house in Siena, Italy, right after a thrilling car chase around the Carrara roads between 007's Aston Martin DBS and the black Alfa Romeo convoy driven by White's goons. The villain manages to escape thanks to the aid of Mitchell, a mole inside MI6 who is later killed by Bond after a foot chase over the rooftops of Siena during the Palio horse race. A DNA analysis through the money bills from the Casino Royale winnings stolen by White leads 007 to Port Au Prince where he will mistakenly come across Camille (Olga Kurylenko), the former lover of Dominic Greene (Mathieu Amalric), a very influential ecologist who is apparently tied with Quantum, the organization behind Mr. White and Le Chiffre. 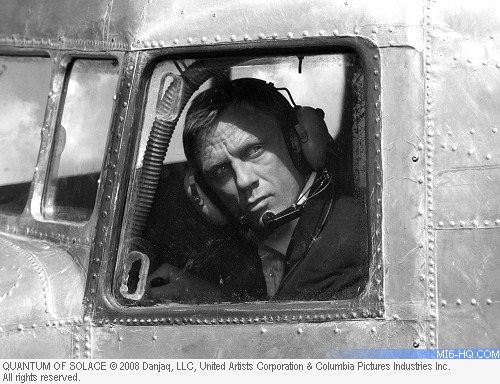 Bond then follows Greene to Bregenz and, seeking the help of René Mathis (suspected of treason in the previous film, but now proven as a good guy) he will travel to Bolivia where Greene is launching a so called Tierra environmental project. 007 investigates Greene and his "motivation for revenge" sees him go rogue and become the target of the MI6 and the CIA as he tries to avert Greene's project: to leave Bolivia without potable water before forging an alliance with General Medrano (Joaquín Cosio), who wants to take over the country. In return, Greene will be the only provider of the natural resource. Aided by Camille, who wants to avenge her parents and sister from the brutal attack Medrano led on them during her childhood, and CIA agent Felix Leiter (Jeffrey Write, once again), Bond manages to defeat Greene and trace another Quantum agent, Yusef Kabira (Simon Kassanaides), who is none other than the "deceased" boyfriend of Vesper. Bond confronts Yussef in Kazan, Russia, where he was seducing Corrine (Stana Katic) a Canadian agent to blackmail her in the same way he did to Vesper. MI6 then arrests Yussef and M meets with Bond, who lets go the memory of the girl he loved and goes back to job. 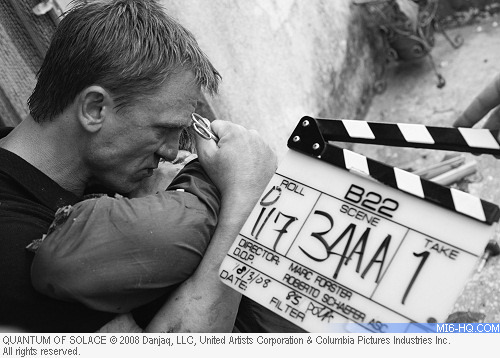 'Quantum of Solace' had a troubled shooting due to the WGA strike from 2008, causing the film to be shot while the script wasn't finished. As a result, the script by Paul Haggis, Neal Purvis & Robert Wade is confusing and lackluster in comparison with their work on 'Casino Royale'. Marc Forster does a good job during the dramatic moments: a scene where 007 remembers Vesper after drinking six Martinis, for example; but the action scenes went without any directorial supervision whatsoever leaving Dan Bradley to overuse the shaky camera style he seemed very fond of. Mathieu Amalric, an actor known of his versatility, was completely wasted as a villain who acts more like a bureaucrat than as the member of a sinister organization. Gemma Arterton as agent Strawberry Fields is the eye candy of the movie, but the so called 'Goldfinger' homage as she lies down dead with her body full of oil akin to Shirley Eaton in the 1964 film is completely way off target. The main title sequence by MK12 doesn't come to the standards of visual arts genius like Maurice Binder or Daniel Kleinman, and Jack White & Alicia Keys' "Another Way to Die" title song is instantly forgettable. The iconic gunbarrel sequence is sadly banished to the end of the film with no justification at all. There are some very good points in the technical aspects: Roberto Schaeffer's cinematography is rather sharp and David Arnold provides a memorable soundtrack reusing a few cues from the previous film as the "Vesper" theme. 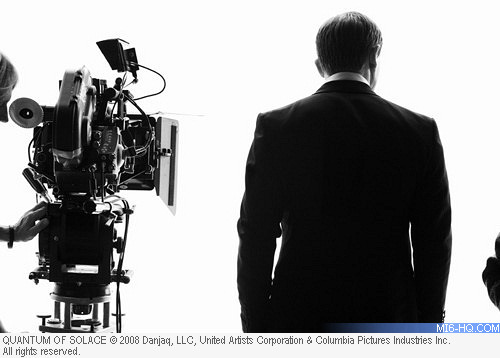 Costume designer Louise Frogley also made a good choice in fitting Daniel Craig into the classic Tom Ford suits. It may be very subtle, but in 'Quantum of Solace' we see a small evolution of James Bond. Daniel Craig's performance feels lighter as he adds some needed freshness to the role, being a bit less rough than in 'Casino Royale'. This is the movie where 007 learns to use his licence to kill wisely, to resign himself to the world of espionage: a world of betrayal, death and no mercy. The desert, widely seen throughout the end of the movie, is a metaphor for James Bond's lonely life.